If you want a truly unique wedding cake for your big day look no further than Multi-award winning cake designer Danielle Gotheridge. Danielle Gotheridge has been designing unique cakes for over 10 years. I met Danielle at her first shop in Netherfield while delivering wedding flyers. This was around the time I was first setting up as a wedding photographer. Since then she has not only gone from strength to strength but she's become famous! Not that it's gone to her heard, down to earth Danielle takes it all in her stride. It all started when she exhibited a bespoke designed cake at the Cake International London, which lead to her to tour with the BBC Bake and Cake Show. She's appeared in films for Paul Bradford's Sugarcraft School, and now runs cake decoration courses in London. Read more about Danielles success in the Nottingham Post. Danielle has developed signature techniques with her fresh approach to edible art and decorating techniques. Such as how to wrap fill, quilt icing, and uses edible paint to craft messages in her designs. She’s even written a book it, All You Need is Cake. Over the years her customers range form celebrities such as Pauline Quirke and Justin Bieber to corporate clients Notts TV. Recently she designed an amazing 17 tier wedding cake for a travelers’ wedding. Planning starts with pen and paper to create a bespoke design. Danielle then gets handy with her hands to create stunning masterpieces. She takes into account the personalities of her clients and can create almost anything in edible art. Cities, places themes and special moments, colour schemes and fairy tails, to name but a few. No stencils used here, Danielle explains in detail the techniques she has developed to create amazing edible decorations. She told me that the 3 main tools she works with are a pallet knife a rolling pin and edible paint. 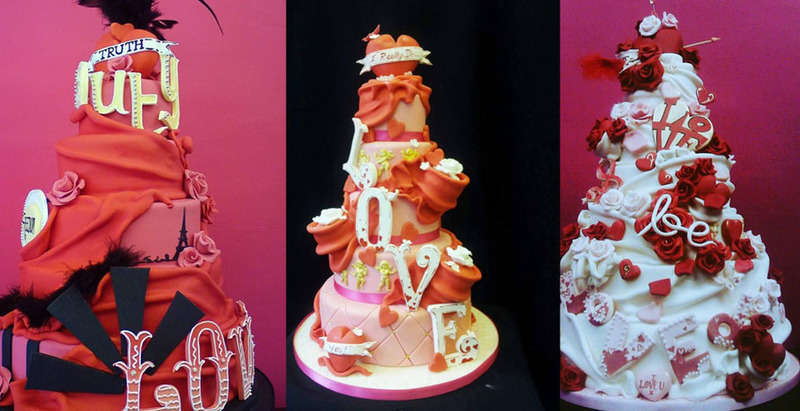 Here’s my personal favorites from her extensive range of bespoke wedding cake designs. Still based in Nottingham, Daniel made the decision to close her shop in Hockley to run courses in London at the artisan coffee shop, Coffee ,Cake & Kisses. She’s also landed herself a three-year contract to work with students in Germanys Bakers’ Academy in Weinheim. So if you want a wedding cake with real wow factor Contact Danielle for more information. All the images in this article were provided by Danielle Gotheridge. A stunning, summer wedding at the Arkwright Rooms, Nottingham. Andrea Palmer wedding photography showcases one of her clients weddings and gives insight into this unique city centre venue. Bridal hair and make up tips for your wedding day by professional make up artist and hair stylist Emma Louise Berry.